A fantastic idea for promoting independence - the wardrobe extender! When we moved into this house we had a lot of little areas that needed work to support Otis' independence. The children's wardrobe is smaller than in our last house however it is large enough for all of their clothes (Bruder trucks out of rotation are stored at the very top). Behind the doors to the left are three shelves. Caspar has the top two. The top one for his personal items. Each child has a shelf for their folded clothes, a large rectangular basket for their shorts and pyjamas, sports clothes and a little basket on the side for socks and underwear. But it was the hanging space that was really a problem. In our previous house we (with a dowel and a drill) installed a lower hanging rail (you can see it here). This worked so well for both children. As soon as they could stand they could select their own clothing. But this house is a little different, we don't know how long we are going to be here and I don't want to put holes in the wall. So I folded a couple of shirts for Otis and put them in his basket - the rest of his shirts were left hanging on the top rail with Caspar's clothes (which Caspar is tall enough to reach). It didn't work at all. Otis didn't want the shirts I had folded for him - he always wanted one that was hanging, he always needed help. So Caspar and I would help and get his shirts down. I even put a step ladder hoping he could use that to reach his clothes. It wasn't great. Sunday morning I heard him crying, most upset he couldn't reach his shirts. Ok I got the message. For a couple of weeks I had been considering a little wardrobe like this. But the cost and space? It's kind of obvious now - we needed a wardrobe extender. I ordered it Monday and it was here Tuesday (online $10 for the extender and $10 for shipping). I didn't know if I would really like it but it's simple and so easy to adjust. (In the US this looks like a great option). Otis was thrilled. It really is the little things! The new year is a great time to think about strategies to promote peace in our home and classrooms. Perhaps a time to start preparing peace lessons, peace education activities or organising peace books. The Peace Stick is a wonderful peace book inspired by the Native American legend of the talking stick. It is a fantastic choice for reading out-loud perhaps at group time to promote peace at home or in the classroom. One of the reasons I really like this book is because it tells the story of squabbling siblings - something most parents can relate to. It also takes the reader through to resolution which is a valuable story. When read out-loud this story holds the attention of both my children, Otis who is three and Caspar who is seven. Importantly this is a book about respect, listening and improving communication with each other. Learning and teaching ourselves and our children to listen from our heart, to listen with complete attention, to listen to everyone's point of view calmly can lead to such a great understanding, acceptance, love and harmony between human beings. We can all bring it about by working with ourselves and our children. - Nidhi Misra, The Peace Stick. In true Montessori fashion this book is very clean and clear in appearance and is beautifully illustrated. Peace education is going to be a focus in our home in 2015, it souldn't be something we take for granted, it is something we can role model and actively promote. For further ideas this is an amazing post from Montessori for Everyone - 10 Ways to Promote Peace in Your Classroom - it's just as relevant to the home. Looking for the very last chocolates in the advent calender. on the water slide (or at the swimming pool). You have to love an Australian summer Christmas. From our family to yours - we wish you a very Merry Christmas. What is under your tree? Gift giving. This week has been particularly tough for Australians. Can I say it has been especially difficult for mothers? I don't know, everyone grieves differently however I know that I grieve more now that I am a parent. When a tragedy happens involving a mother of young children or children it touches me it ways it didn't previously. The most important part of my life is my family. Keeping healthy and safe. Nothing else comes close. Tragedy puts everything else in perspective. I'm still going to run with this post though because we are still giving gifts and there is still a place in our lives for thoughtful gift giving. My biggest question is what is (or will be) under your tree? My friends and I have been asking each other this literally for months. I think you get the best ideas from like-minded parents not from a catalogue. So above is what will be under our tree for Caspar and Otis. This post contains some affiliate links. 1. Good People Everywhere by Lynea Gillen. A heart-warming, comforting and reassuring story about the good people in our community. 2. Our Big Home: An Earth Poem by Linda Glaser. A poem that celebrates the richness of our planet. 3. Wild Plants of Wider Brisbane. A Queensland Museum Guide. Because every home needs a local field guide. 4. Make your own Insect House. Something for the boys to enjoy outside. Our garden is already full of insects but I wonder what this house will bring. The boys will also have fun building and putting it together. 5. Pyjamas. I was desperate from some Christmasy pyjamas but it's difficult to find quality that isn't wintry. These are nice lightweight, summery pyjamas. I may or may not give these to the boys before Christmas - perhaps on Christmas Eve? 6.& 7. Wooden Shields and Swords (similar available at Nova Natural). Caspar (7yrs) loves stories of vikings, knights and kings. There are two of each, it's likely one set will go to Otis, after all Caspar will need someone to play with. 8. Siku trucks and vehicles. This is what I suggested to my sister to give to Otis. The Siku vehicles come in so many options and they are small (small often like matchbox cards depending on the vehicle) they have many moving parts and are all made to scale. Otis has many of these already and will spend hours in play. 9. Bruder Tractor. Long time readers will know that we love the Bruder trucks. We have many that are adored. However we purchased all of our Bruder trucks/diggers/vehicles for Caspar (many years ago) so I thought it was time for a new one to add to the collection. They are good quality, made to scale and most parts are movable - making them really fun and interactive. 10. & 11. I almost feel bad about giving practical items for gifts but I think it adds to the fun. The boys will love unwrapping gifts even if it's something they need - like new lunchboxes and insulated bags. When Caspar started school we used a few different brands - the lunchboxes we used at home didn't necessarily work for school. He has used and loved his Goodbyn lunch box for a couple of years so he is getting a new one and Otis will need one for when he starts extended day later next year. 12. As teenagers Aaron (my husband) and I lived in Unley, only a block away from the Haighs factory. Haighs Christmas tins are a tradition. Some years we have missed out if we weren't visiting Adelaide or passing through Sydney. I'm thrilled that Haighs finally have an online shop delivering Australia wide. I've also been asked about handmade and teacher gifts. Do teacher gifts need to be handmade? I don't think so. It's nice for the children to be involved but I think it's totally acceptable to purchase a small gift if it has been well chosen/considered. One year we were short on time and we gave each teacher a blank journal and lovely pen. It actually turned out to be really expensive, I think I was trying to make up for not having a handmade gift. But what handmade gifts have we given to teachers, neighbours and friends? Christmas Soaps - We use melt and pour soap. One year I ordered a couple of kilograms and it's lasted a few Christmases and we've made Easter soaps as well. We put a couple of soaps in a small cotton bag. Beeswax Candles - An all-time favourite and we give these so often. Really young children can roll the beeswax. We have used a couple of sources but I think the colourful wax kit is from Dragonfly Toys (similar in the US here). They also smell so good when they are being used. Gingerbread Cookies - Perhaps these are everyone's go-to gift. We make a big batch of dough - Caspar can now make this independently, and make/bake a tray of cookies at a time and keep the rest of the dough in the refrigerator. I love having guests over and while the kids are playing (or have them involved) it only takes a minute to roll the dough and bake the cookies. Guests love fresh and warm gingerbread cookies. Neighbours do too! We've also put some in little brown paper bags and given as teacher gifts. Homemade Strawberry Jam - We've only done this one year but it was a hit. Because of the heat/cooking children can only help in a limited way however they can still feel the pride in giving handmade jam. Children can chop fruit and label jars. Because when making jam there is so much in quantity this is one gift that really goes around. We have also given small potted herb/succulent plants to various teachers and friends - ensure the plant is nice and healthy and decorate with a ribbon. I feel the most important part is for the child to be a part of the gift giving. And to tell the important people in your life that you appreciate and love them. If you are short on time but still want a meaningful gift it's not too late get a A Girl and Her World e-Card. All e-Cards and donations support girls in the pacific islands attend school, this includes supporting their families. A really special gift. Gift Ideas. Infant/Babies, Toddler and Preschoolers. When I look at materials for my children I ask the same basic questions as everyone else, what is it made of, is it good quality? But my focus isn't on the materials. It's never really about the materials. It is about what the child can do with the materials. Yes, our brooms are wooden, high quality. But what can a child do with it? The child can participate. They can clean up a breakage. They can tidy a space or a room or a house. They can feel empowered, trusted. What about a lovely Butterfly mobile. They are designed by Holly Zucker and handmade in the Pacific North West. But what can the child do with it? They provide a very young child their first opportunity to work. They provide opportunity for concentration, for beauty, for tracking, for visual discrimination. Here are my picks for gift giving from HWM Shop with international alternatives provided where possible, ages are not always relevant but I've broken them into three general categories. 1. Three Shape Puzzle. Once a baby can sit independently they will like to work with their hands. This is the same Australian made shape puzzle we used in our home. Otis worked out the circle first and then spent time working at the square and triangle. Puzzles promote hand eye coordination, visual discrimination and allow the young child to concentrate and complete a task. (Similar available by Kid O). 2. & 3. Butterfly and Whale (Mother and Baby) Mobiles. Mobiles are the child's first work. Butterflies and whales would have to be two of the most beautiful animals to put on a mobile. The whale mobile was used both by Sara at Feeding the Soil and Meg at Sew Liberated. (Also available at Michael Olaf). 4. Mini maracas provide a lovely sensory experience. Once a child is old enough to grasp and shake they begin to gain an understanding of cause and effect. (Also available in France at DEUZ). 6. This crochet rattle is divine. Otis used his for months and it's totally chewable. The young child can grasp the lovely tactile rattle and shake for the bells to ring. The child will begin to make intentional and coordinated movement to shake the rattle. (Also available from Pinkhouse on Etsy). 7. 9. and 10. 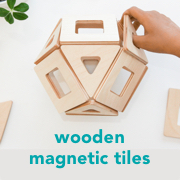 Beautiful and simple wooden toys for the infant. A child who has just begun to grasp will like to hold onto the wooden ring (perhaps the most simple gift ever! ), a little older and they can work on hand to hand transfer and wrist rotation with the interlocking discs and the egg and cup is perfect when they are sitting for hand eye coordination. (Similar available at Michael Olaf or Beginning Montessori). 8. A lovely soft hairbrush. For the care of self table or just for a gentle brush. Some child just love the soft and relaxing feeling of having their hair brushed. 1. Montessori Toddler Christmas Gift Pack. I have found that toddler love to bake. They love to cook and stir and watch their creations come to life. Aprons help to set the scene and little tools are easier to the child to use and control. It's also great for children to use a few basic tools in the kitchen that are just theirs, that they can have ownership of. (Apron available from Handmade Montessori, lots of other child sized kitchen tools are available at For Small Hands). 2. Wallet Cards. Durable and educational. Fun for children starting with letter, colour, shape and number recognition. These are popular all year round but fantastic for small/family/friend gifts and stocking stuffers. (Also available at So Awesome). 3. Matching Cards. Matching cards that can also be used as vocabulary cards. Animal and plant cards are always my favourites for toddlers. These are beautiful, bright cards which children can use for matching promoting cognitive development and concentration. When aligned with your child's sensitive period/developmental needs and interests, children will use these repeatedly. This is one of my favourite posts of Otis using the matching cards. (Also available at Michael Olaf). 4. Transport Puzzle. One of the reasons I like this puzzle is because of it's difficulty and size. As it is actually four puzzles in one box, I present only one puzzle at a time. The puzzle can be challenging for an older toddler however because only one puzzle is offered the child can complete it in a short period of time. The transport subject appeals to many children and it's also a lovely puzzle a couple of children can work on together. (Also available from Amazon). 5. Australian Animal Packs. Children are attracted to animals and small models. Australian animal models allow children to explore, examine and get to know the animals in their natural environment, perhaps the birds they see in the tree or animals they have only observed from afar. 6. Child sized Bucket, Broom, Dustpan, Window Washing Set. For the toddler at home I feel it's all about practical life. Enjoying the physicality of pushing a broom or swishing the window squeege. Children enjoy having their own materials and to be able to work along aside their care-givers as they attend to the home environment. (Many similar available at For Small Hands). 7. Matching Baby Animal Game. A beautiful cardboard lotto game. Very young children can use the card to recognise their favourite animals. Later the game can be used for matching or lotto. (Also available at Amazon). 1. Miss Rhonda's Readers. Preschoolers can feel a sense of success and pride once they start to read words, then sentences, then an entire book by themselves. Readers such as these are a great way to promote and encourage little readers. (Also available at For Small Hands). 2. We love our movable alphabet. From learning to write their own names, to learning how words are formed. Once children know (most if not all) the letters they can have fun forming/constructing words then putting a few words together to sentences. This movable alphabets comes with a lesson plan included. (Also available at Michael Olaf). 3. Geometric solids. A little more interesting than usual blocks. Great for learning geometric forms. Put these in a Stereognostic bag and have the child feel and guess what's inside. The stereognostic sense allows the child to discriminate size and shape through the use of touch. 4. Child of the World Floor Puzzle. I love the global feel of this puzzle and it's great to work with a small group of children together on a table or on the floor. For team work, visual discrimination, because it is large it will require concentration and patience, and possibly could be considered cultural work. (Also available at Amazon). 5. Lyra Ferby Colour Pencils. Lyra are our favourite brand of pencils and the Ferby are great for little hands. The pencils are really high quality, highly pigmented and we will never go back to cheaper brands - you will see and feel the difference. These are also good small gifts or stocking stuffers. 6. Australian Ochre. We love Ochre for a unique and authentic art experience. They can dry up and be used over and over again. A different feel and experience to paint and it's completely natural (it's straight from the earth) and non-toxic. Sourced ethically by Indigenous educators. A great way to lead to Indigenous or Australian studies or stories of the Dreamtime. 7. and 8. Leaf Rubbing Plates and Shape Stencils are fun for those learning pencil control and may be looking for some quiet work to concentrate on. The stencils are also fun little gifts, perhaps paired with a pack of pencils. (Although not similar these are lovely shape stencils at For Small Hands). I'll also be posting about what will be under our tree. Our gifts to the boys are not so exciting, some are practical (think books, new lunchboxes and pajamas) and others fun but I'm always interested to hear what others are getting so, I'll be posting here! Our days have been hot, sticky and often stormy. Our art shelves were one of the last areas that we organised. The study doesn't have any built in storage so we have utilised some open shelving. The boys can reach almost anything. The hot glue gun and aerosols (fixative and adhesive) are on the top shelf where Otis can't easily reach. They have access to lots of paint, pots and brushes. Ready for when they feel inclined. Some days are definitely theme related, the boys will start on something and work on it all day. Caspar loves anything space related and together they painted the solar system. Caspar traced around his magnetic planets and then they painted them in. The planets are in some sort of order - I didn't want to intervene. Caspar uses these magnetic planets and this solar system book. Some random plant paintings. I need to find a good book (I'm open to suggestions!) so they can identify what is in our garden. Painting decorations made from white clay (I suggested and facilitated this one). I love it when they get their paint on! What we are reading in December, please note this post contains affiliate links. I've been reading DO/ PURPOSE/ Why brands with a purpose do better and matter more by David Hieatt. From the DO/ series of books this is a simple, motivational business/start up book. Short, sharp and to the point! Otis has been reading Museum Shapes by The Metropolitan Museum of Art (New York). A beautiful way to learn and identify shapes. This book introduces children to shapes through the Metropolitan Museum's extensive and varied art collection. We also have Museum ABC which is just as lovely. Do your children read out loud to you? Caspar has always been against this but as he is at home this term I feel it is important for me to find out more about where he is with his reading, so I can help with the areas where he needs it the most. This is a chapter book that Caspar has been reading out loud, each chapter finishes with the focus words from that chapter. It is a great way for us to go over the words/sounds he is having trouble with. Do you have any books on your wish list? These are two I have ordered and hope to put under the Christmas tree - Our Big Home and Good People Everywhere. Have you read these? If they are good I am sure I will let you know. How are you? We are ok, struggling at times. This whole homeschooling thing has it's challenges. We have toured and Caspar has spent some time at their new school. It's a lovely place, a Montessori school right on the river. Children can attend up to 15 years, which I think is equal to grade 9 or 10. Observing the older classrooms has made me feel really excited for the future, to know that a Montessori schooling doesn't have to finish at the primary level. It's really opened my eyes. I know many people consider Montessori for younger children or even just preschool but Montessori has so much more to offer. I wanted to share a few links with you if you have time for some Montessori reading. Maria Montessori is a wonderful site. I really enjoyed this article by Junnifa - The Best Gifts for the First Year. Here is a treasure trove of articles useful for parents at Montessori Services, lots about practical life and a few enjoyable articles about baking with children. I really hadn't thought about baking with premade pastry but I think Otis would enjoy it. I totally freak out when asked to be interviewed and I usually decline! But who can say no to Baan Dek? Here is an article where I was interviewed by the lovely team at Baan Dek Montessori - Spotlight: How we Montessori. When I look for Montessori (in the home) inspiration I often click over to Montessori on the Double. Here is a sneak peak of how the children's study is coming together, it's actually a really fun space to be in (as pictured below, we recently put a big crafting table in the middle of the room - it's working out well) and Otis (pictured above) doing some shape work. One day Otis spilt some milk on the kitchen floor. 'I'll just go get my mop' he said to me and off he went. He cleaned up the milk and put his mop away. He was two. I totally credit his school (and teachers) for this as he had recently started in a formal Montessori classroom. I guarantee you cleaning up after accidentally making a spill or breakage happens naturally, automatically to children (including toddlers) in Montessori environments all around the world - everyday. 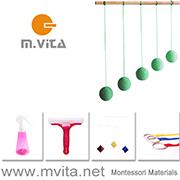 Often in Montessori schools using a mop or wet mopping is actually presented as a lesson. Not to say that Otis always cleans up his spills (he doesn't) but what (to me!) is miraculous is that at two years old he could recognise a spill and without even thinking collect the materials and clean it up. This can only happen when and where the environment allows for it. A child is much less likely to clean up if his materials are out of reach, he doesn't know which cloth to use, if he has to ask for help. It's not just about independence. It is also about self pride. Contributing to a community. Doing a job/task well. Completing a job/task from start to finish. About being a responsible person. It is about respecting a child enough to allow them to clean up after themselves. Our cleaning station as pictured above is located in a small cupboard under our stairs. It is the same area where I keep my broom and mop and our vacuum cleaner and buckets. Previously we stored the children's cleaning materials in and near the kitchen. We still need cleaning cloths and a spray bottle in the kitchen kept on the pantry shelves, but where the materials are located really depends on each family and each home. A children's cleaning station isn't just for children in the sensitive period for practical life. It's for all children. In the sensitive period or not children need to have access to their materials. Caspar (now 7) doesn't particularly gain enjoyment (but perhaps satisfaction) from cleaning (as Otis does) but still needs to be able to find and reach a broom or dustpan for when he needs to clean up a breakage or spill. You can read more about our Cleaning Caddy here and Otis cleaning in action in a previous post (sweeping) here and as you will know we have lots of practical life materials including new cleaning cloths and mitts here. 1. HWM Shop, 2. Tiny Me, 3. TAG Toys, 4. JandPWoodProducts on Etsy and 5. TAG Toys Traceable. If you are starting to think of gifts for a child around the two to three year range (perhaps even younger) you might consider puzzles and possibly alphabet puzzles. A Montessori child of this age would be learning lower case letters and their sounds before upper case. Which is why for this age I absolutely prefer lower case to upper case letter work. I also believe that an alphabet puzzle is a great material to have in the home to support the work going on in the classroom. Alphabet puzzles support hand eye coordination and letter recognition. I prefer a basic print font and I am quite picky especially when it comes to the single/double story a's. I avoid puzzles that have the double story 'a' - although most children are adaptable. I like that the letters can be taken out and the child can start to put simple words together (possibly their name) before moving onto the movable alphabet. In short I really support alphabet puzzles. Due to the number of letters most wooden alphabet puzzles are of a good size and are satisfying work for the child. TAG toys have two featured above (3. and 5.) and are more accessible to those in the US. Puzzles 1. and 2. are from Australia. Puzzle 2. comes with a gorgeous felt cover. If you are looking/considering an uppercase puzzle this one (from Etsy) is handcrafted in various woods and is beautiful (also look for their number puzzle).